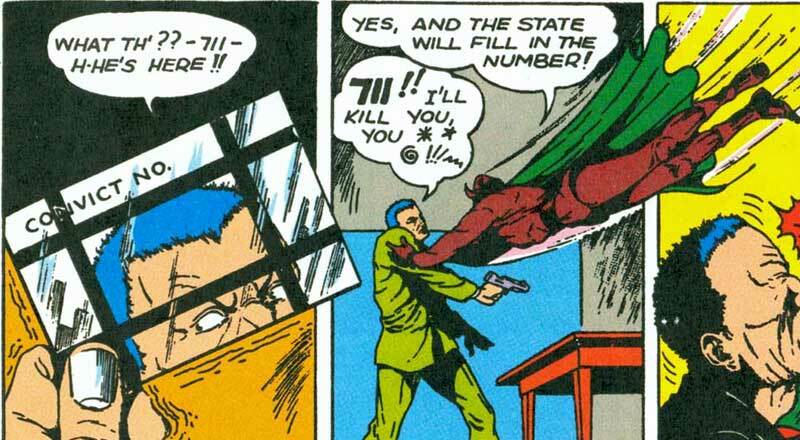 So I was reading my copy of Police Comics #1 (the Millennium Edition reprint), best known for having the first appearance of Plastic Man, and I came across #711 by George E. Brenner. When I read this the first time around a year ago, I instantly thought #711 was the worst superhero ever. Rereading it hasn't changed my mind. It's not as if there's no craft in the work. 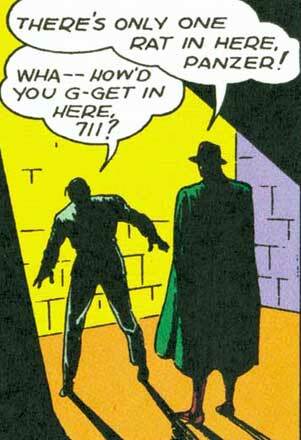 #711's first panel shows some Will Eisner–esque architexture, and it did a good job drawing me in to the story right off the bat. 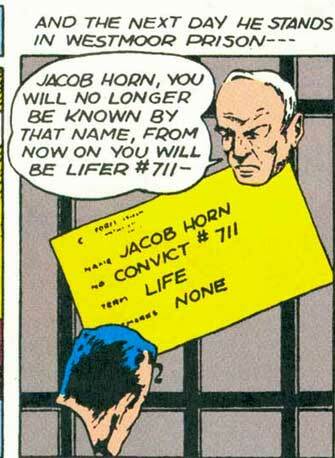 One nice touch about this: I've seen his name listed as both 711 and #711, and I'm going to go with the second one because I can pretend that the prison bars on the window are standing in for the "#" sign. as #711 is just standing there, adjusting his sleeves. So this story starts off with two lifelong friends, Jake Horn and Dan Dyce. Jake's a criminal and the cops are after him, while Dan is an attorney. Jake's problem is that his wife's about to give birth, and he wants to be there for her when it happens. Dan wants to help any way he can, so Jake asks for the most unreasonable thing ever. Because, you know, that's understandable. Jake promises to turn himself in once the baby is born. 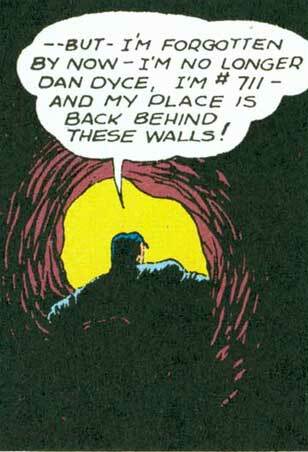 (How Dan decides he's going to get off scot-free with taking the fall for another guy, I have no idea.) What's more, the whole plan hinges on them looking alike, because apparently the police, who have caught Jake twice before, are that stupid. you didn't break out laughing. Dan's number in prison is 711. 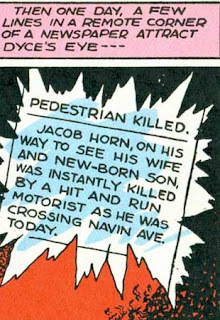 Then, a few days later, Dan sees in the paper that Jake had been killed before he even got to see his wife and new baby. 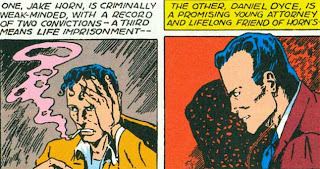 Now you'd think that Dan could show this newspaper clipping to the warden, call it a case of mistaken identity, and go back to his job and his life. But no, prisoner #711 decides that this means he's in prison for life! 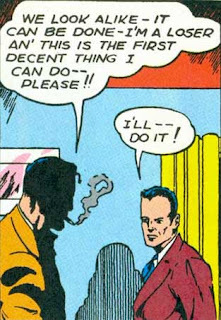 That is the saddest-looking panel ever. Dan somehow gets a hold of a wooden stake (because they have those just lying around, right?) 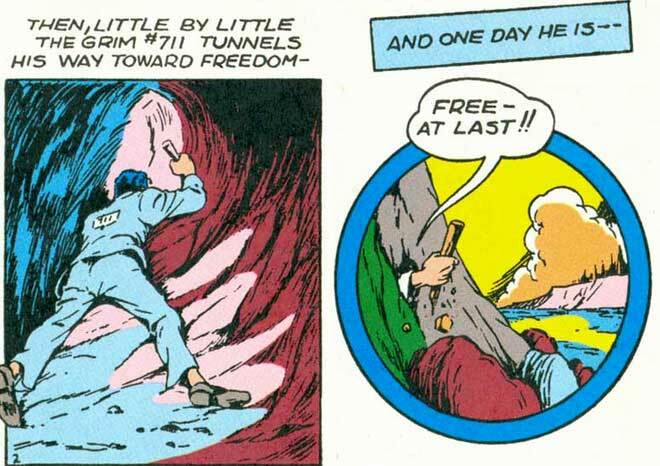 and manages to dig a sizable enough tunnel in the prison wall so he can easily escape. So what does Dan decide once he can escape? Does he decide to just go back to his family and his friends and his old life and his, you know, job? No. No, he doesn't. Seriously, dude, are you insane? 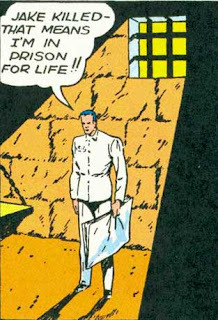 Dan decides to fight crime from inside the prison. 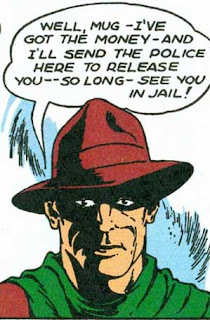 When he finds out that a certain crook named Slick Panzer had been sentenced to a year's term, as part of a larger plot by Panzer to get out and live off of stolen money when his sentence is up, Dan pays him a visit. Panzer calls him "711." This is important for later on. did he get those clothes? 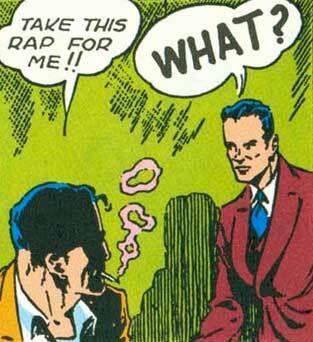 Panzer tells Dan where he's got the money hidden, and Dan sets off to recover the loot. There's a goon guarding it, and Dan surprises him with his "calling card" — a small mirror with bars on it so whoever's looking at it will see himself "behind bars." The goon calls him 711, as if (1) Dan had been fighting crime as 711 for so long (he hasn't), or (2) he recognizes Dan from prison. Either way doesn't really make sense, but let's let that slide for now. Dan then says, "See you in jail!" Get it? It's funny because people say that when they mean on opposite sides of the bars, but in this case, Dan's going back to jail after this and he'll actually see him in jail, and oh I give up. It's impossible to justify this. 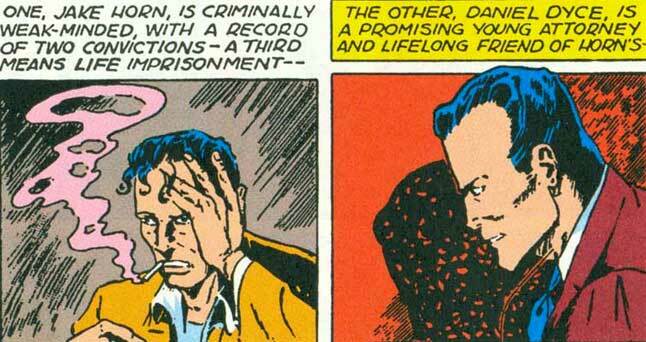 The next day, all the prisoners are talking about Panzer's goon, and Dan joins in on the conversation. All of a sudden 711 is a "mysterious" figure, and when Dan (who is wearing the number 711 on his back!) tells them he knows what really happened, the inmates' reactions are "Huhwhahow?" and not "Oh snap! You're obviously #711, lifer #711!!" And what is up with those multiple question marks at the end? It's been explained to me that the Golden Age kind of feels like that game kids play when they're young, where they create a superhero in the morning and have grown tired of him by lunch, and that is one of the Golden Age's biggest weaknesses as well as one of its biggest strengths, showcasing a ton of energy but also leading to a lot of bad or unremarkable ideas. 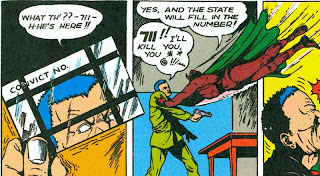 But I can't think of any character that I find anywhere near as ridiculous as #711, as his very premise flies in the face of all logic and suspension of disbelief. He has three—THREE—chances in this story to not, you know, be in jail, and he passes on those chances every single time! Why is this? Does he really just like prison? Was his career as an attorney so bad that he wasn't earning enough anyway and he decided that this way, he at least gets a bed and three meals a day? Did he just like the multicolored stones on the prison walls? And how come no one else has escaped from a prison with such poor security and walls that anyone with a stake (or a spoon, theoretically) can just dig his way out of? And seriously, where did he get those clothes? And those tiny mirrors for his calling cards? 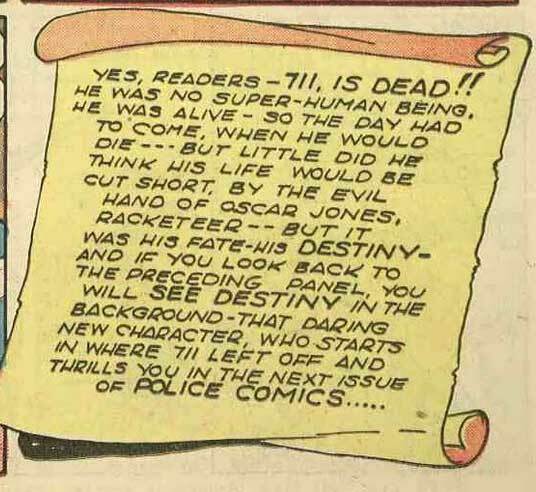 So after reading this, I just had to know what happened to #711, and found out he lasted all the way to Police Comics #15. My initial reaction was, "Wow, I can't believe he lasted that long," and my second reaction was "Wow, he actually died." 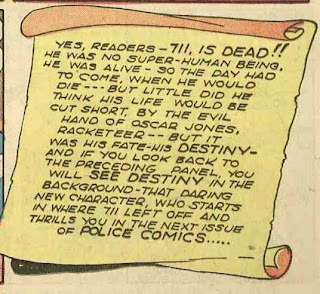 That's right, folks, he dies once he's shot by mobster Oscar Jones (read the whole thing here), giving way to his replacement in the series, a new mystery man named Destiny. So I guess he's notable for being one of the first superheroes to actually die and stay dead. Or maybe he's notable for wonderfully written passages like this. "He was alive - so the day had to come when he would die." Having now written all that, this one little six-pager from August 1941, when read out loud, is a constant source of amusement and hilarity. So, uh, thanks, George Brenner! I am delighted that you're giving Quality Comics and Police #1 some press, even if it isn't entirely positive. Worst superhero ever? Having tried to come up with another candidate, I think you may have a good case. 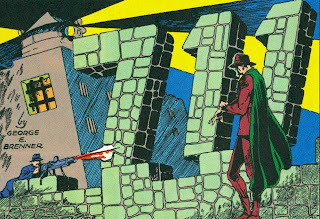 I might toss out Timely's "The Terror" or Marvel's "Rocket Racer" as two other contenders for such a worthy title. 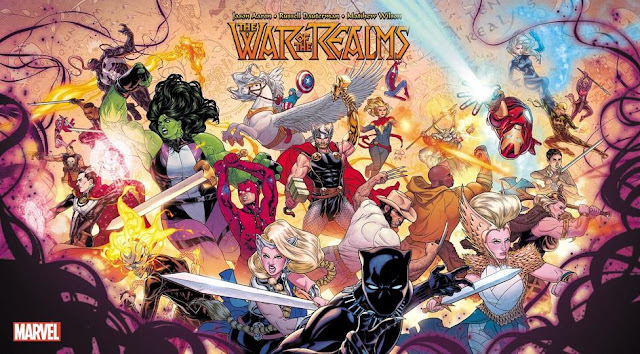 So when are you going to review the rest of Police #1? It is a great book overall.